Crush both packets of biscuits and roast with margarine in a nonstick frying pan for 3 minutes. Line the base of an oven proof baking dish. 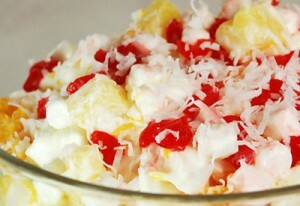 Layer with fruit salad and top with 2 packets of cream whipped. Decorate with pineapple slices or any stewed fruit from the mixed fruit tin.